ClanDonnell has told a few tales of Ireland to audiences throughout the United States. Is it able to do the same in Ireland? We'll find out in November, as ClanDonnell tells tales of Ireland to an Irish audience (perhaps sprinkled with tourists from around the world). 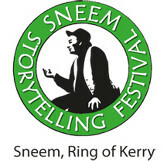 The event is the 4th annual Sneem Storytelling Festival in, of all places, Sneem! Sneem is but a wee village on the Ring of Kerry. We've not been there yet, but are looking forward to it. Visit the Sneem Storytelling Festival website, and like and share it on Facebook. Click the link for the festival brochure. We're not sure, but we think we're listed as a "story teller from abroad".